“I look at them and I’m amazed 10 years has passed,” the quintuplets' mom said. 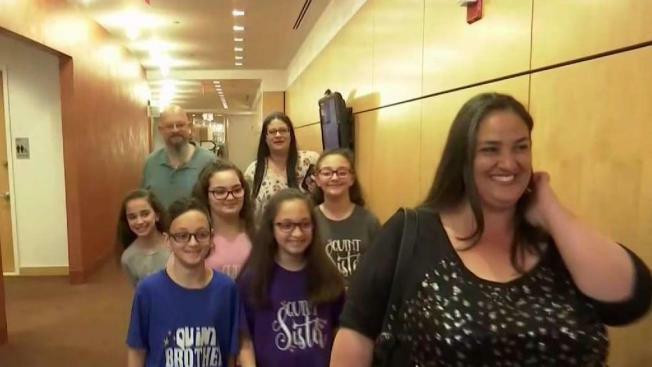 “These are my big kids now"
A set of quintuplets born on Staten Island 10 years ago reunited with staff at the hospital that welcomed them into the world. Jamie Ferrante gave birth to Alessia, Amanda, Emily, Matthew and Ella at Staten Island University Hospital on Dec. 27, 2008, the hospital said. On Monday, the fifth graders and their parents returned to the hospital to help mark Multiple Birth Awareness Month. The family shared a celebratory cake with the Labor and Delivery and Neonatal ICU staff. Ferrante “was only 27 weeks and five days pregnant when her water broke,” according to the hospital. Her babies ranged in weight from 1 pound, 8 ounces to 2 pounds, 4.5 ounces when they were born, the hospital said. Now, they all play basketball for St. Christopher’s School on Staten Island. The five kids are the borough's "one and only set of quintuplets," according to the hospital. During a speech at the hospital on Monday, Ferrante thanked the staff for safely delivering her children. “I just wanted to say thank you, because I feel like if it wasn’t for you guys, honestly, all five of them wouldn’t be here so healthy and beautiful,” she said.